Vacation rental house. 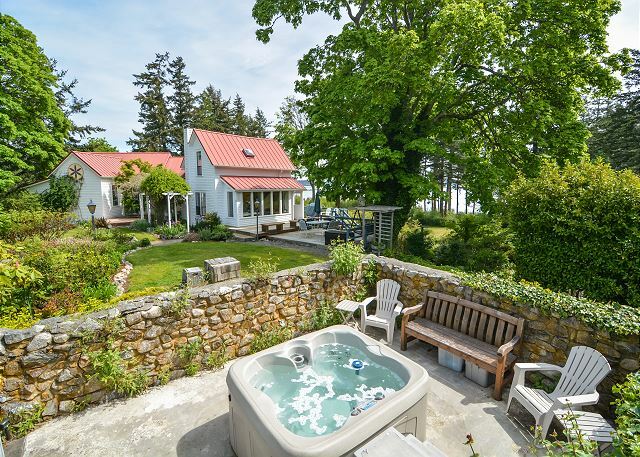 Sleeps 11, 4 bedrooms, 2.5 bathrooms. No pets allowed. 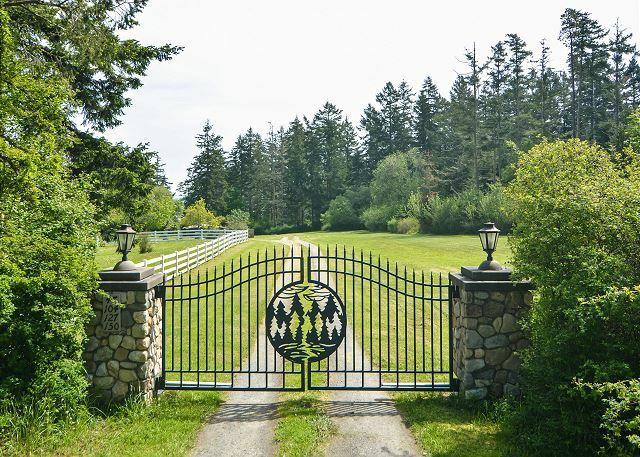 The home's entrance is graced by climbing vines and gardens. 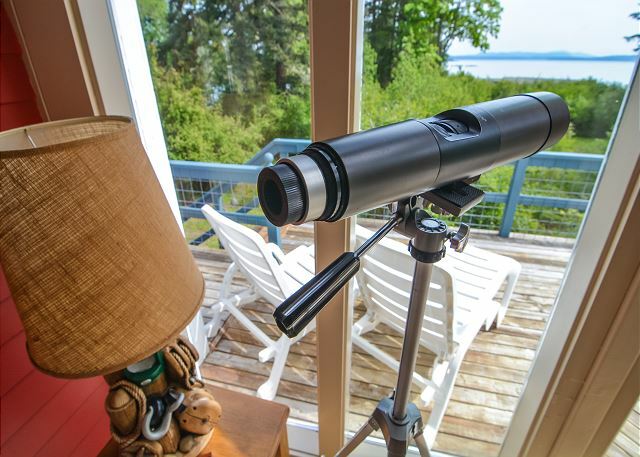 PRIVATE BEACH, HOT TUB, VIEW OF MOUNT BAKER, CLOSE TO GOLF COURSE, TENNIS COURSE & FRIDAY HARBOR, EVEN A MOORING BUOY! Before San Juan Island was discovered as a travel destination, Friday Harbor was a cluster of modest houses on a few central streets. 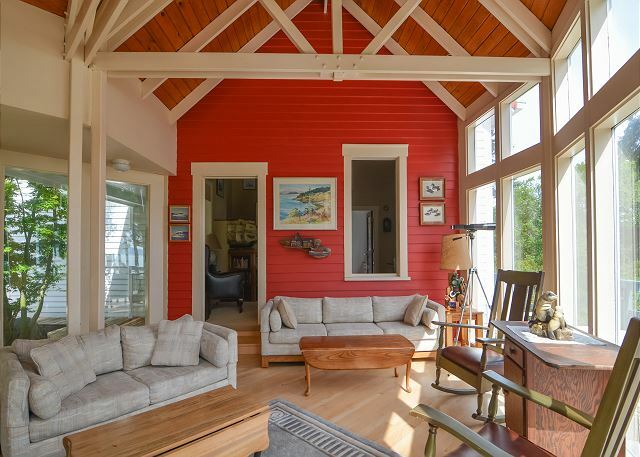 When the commercial area began to expand, two of the vintage homes were preserved by moving them south of town and onto a beautiful stretch of Griffin Bay waterfront. 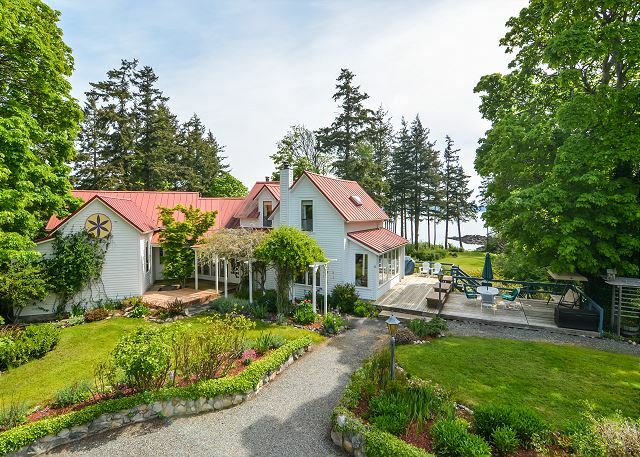 Creatively connected by a new central living space, these historic structures now form the opposing wings of a delightful island residence. The property is located behind a gated entry, so it’s extremely private, however the golf club and tennis courts (open to the public and you can use our rackets) are just across the road and town amenities are within a few miles. 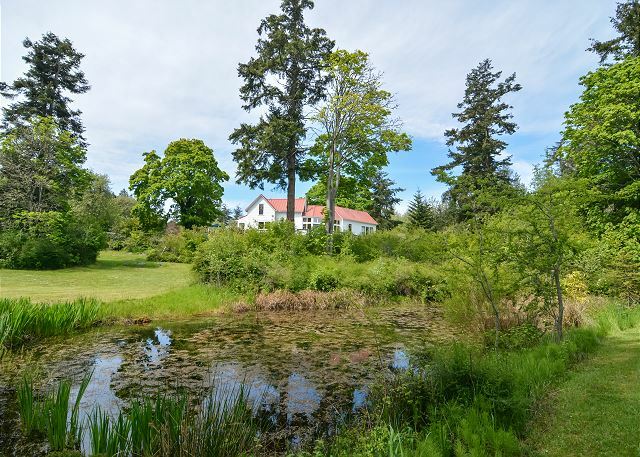 The landscape surrounding the home is simply gorgeous, offering 8 sunny acres of garden, grassy clearings with a badminton set you can use, ponds to explore, and a hot tub under the starlit sky. And then there is the beach. 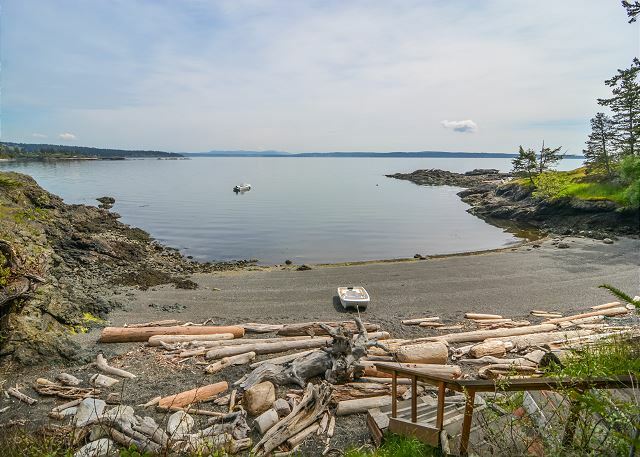 Just wander down a pathway at the shoreline to find your own sheltered pebbled cove, complete with driftwood logs, tide pools, and a dead-ahead view of Mount Baker. 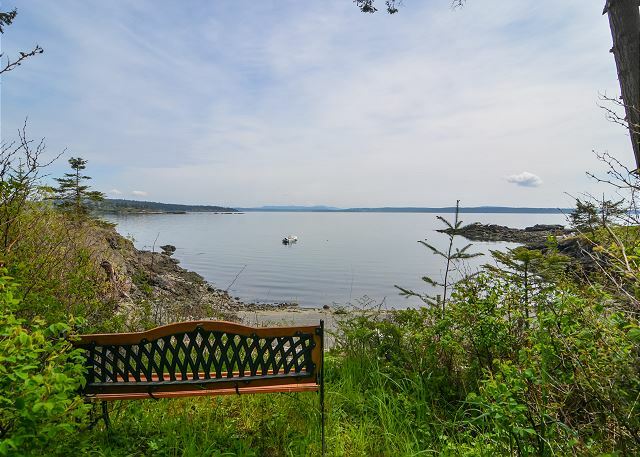 This is where you will likely spend many hours in quiet contemplation and enjoying picnics. This beautiful waterfront is also a great spot for launching kayaks and there’s even a buoy for your use. Confirm size of boat prior to arrival. 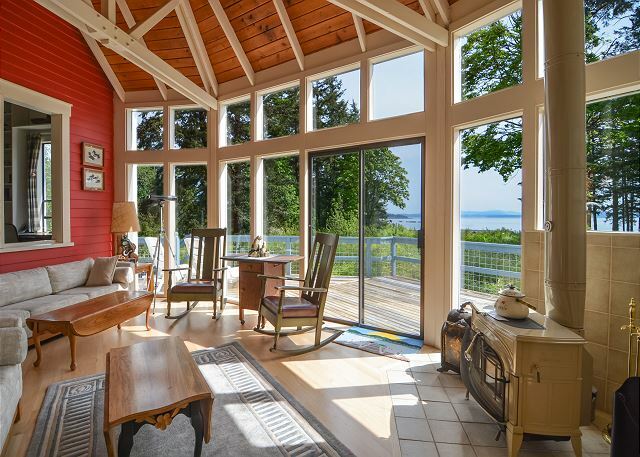 Those seeking to relive carefree childhood summers will love this vacation home. The older sections of the residence create a sensation of remembrance. 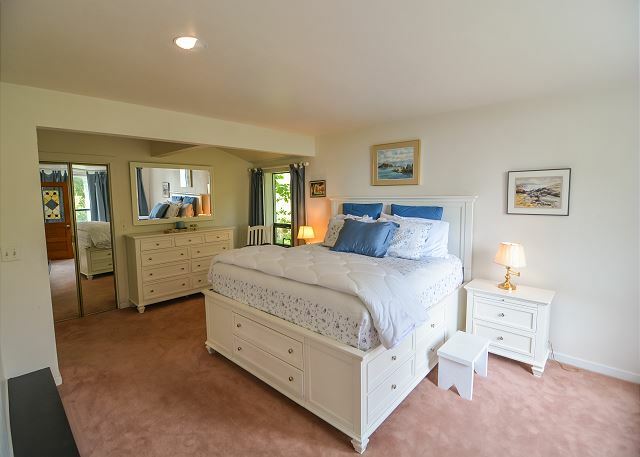 One wing rambles through a small office into a master bedroom with king size bed, en-suite bathroom, and walk-in closet. 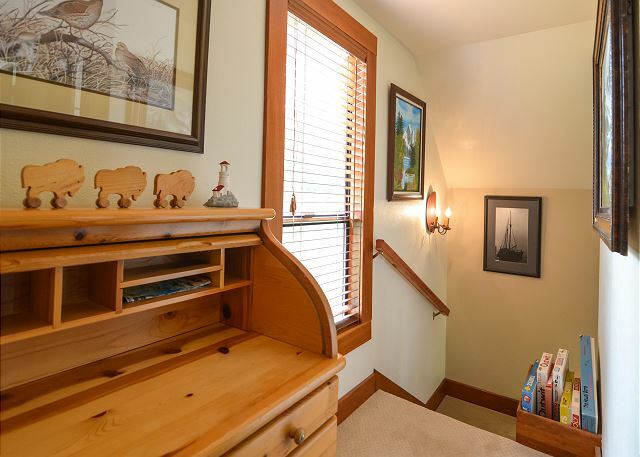 Above the office is a semi-open loft with two twin beds where children and teens can snuggle up. Note that there are low ceilings and non-conforming stairs & railings. The kitchen with breakfast nook and the laundry room are on the main level of the second wing. 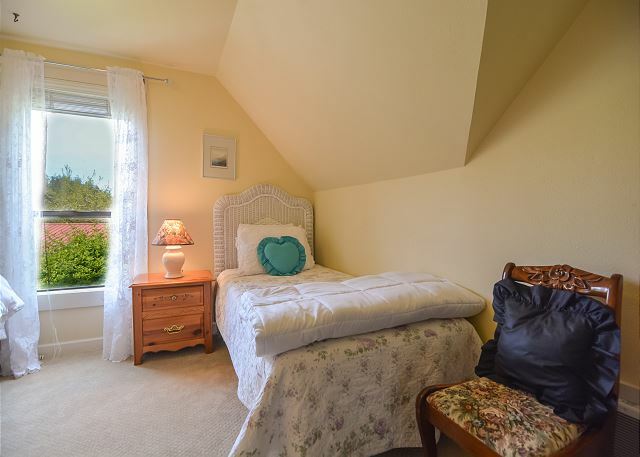 Upstairs are two additional bedrooms, one with a queen bed plus futon, and the second with one double bed and one twin bed. 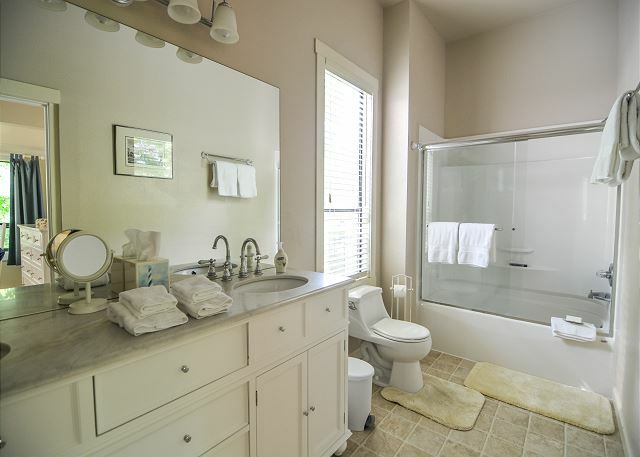 A second bathroom with tub/shower is on the upper level as well. The two older wings are separated by the dining room and living room. Satellite TV & WiFi are provided as well. 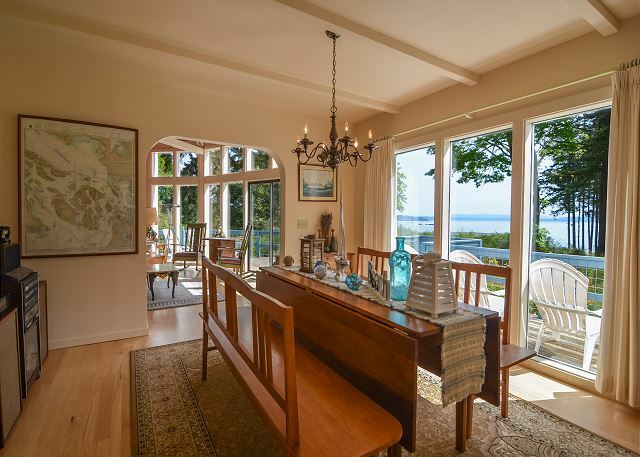 The waterside windows frame an incredible view of the bay, glorious sunrises, and Mount Baker. 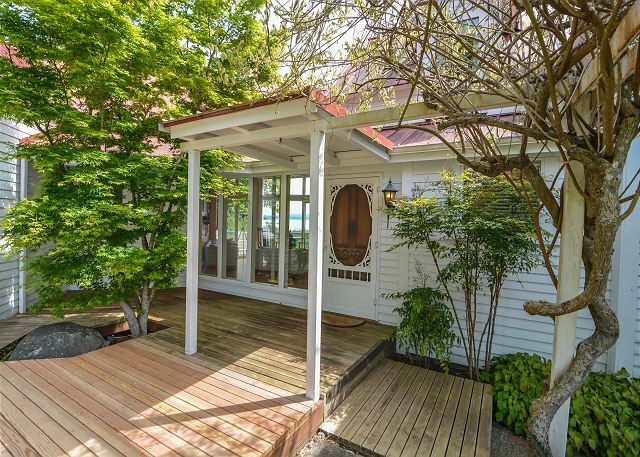 Stretching across the front of the home is an inviting deck containing lounge and dining furniture plus a propane BBQ. The home is comfortable, attractive, and unpretentious. The atmosphere is a small step back in time, a place that children of all ages will cherish as they run barefoot in the yard, wade at the shore, play games and laugh. Come make your own Island memories at Griffin Bay Beach; we expect you will want to return year after year. 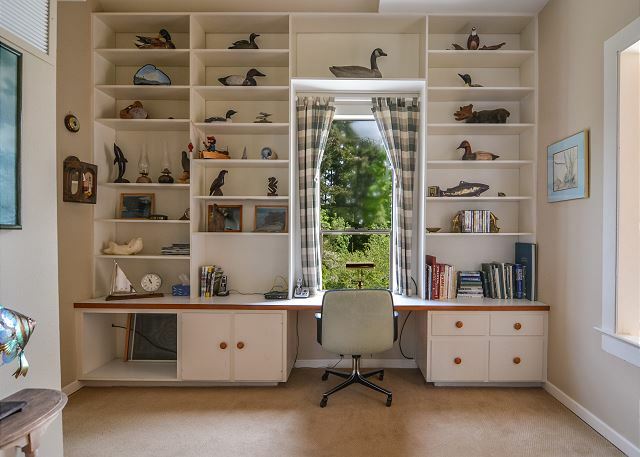 This home and property was such an amazing surprise. All the pics were spot on. This place served our group of 10 perfect. They have furnished it with everything you could possible need and more. It was so comfy and the beach was awesome. We rented a boat at Friday Harbor and kept it for a day there. The crabbing was fantastic. We would recommend this for a family gathering to everyone. We had room to park a motor home that 2 of our group stayed in. The home is totally beach decorated and we saw new things everyday that we had missed. Lots of fun equipment as well. Just a few minutes from Friday Harbor. You will be very happy you chose this place. Our family of ten including four grandchildren had a wonderful time in early August. Beautiful weather to enjoy the outdoors on the property. 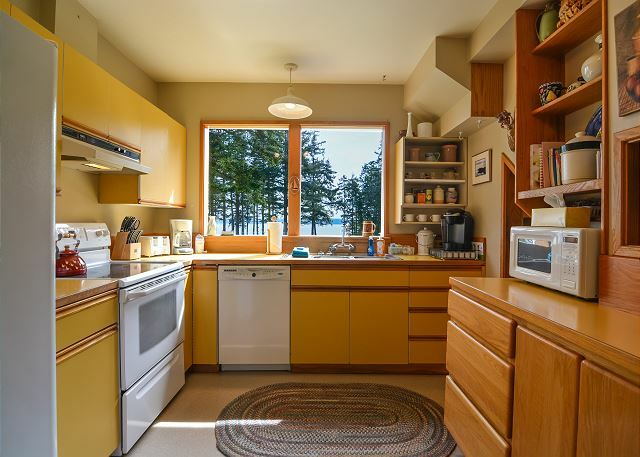 So spacious, wildlife, stand up paddle boarding, and private. Great location to get to golfing, hiking, and site seeing. Fun week with the family! My husband and I, kids and Grandkids had a great time at Griffin Bay. They house was spacious and just a little quirky to make it interesting. We had 9 people and would have liked another full bathroom but we managed. The house was nicely equipped with outdoor activities for the kids and the beach, although smaller than we imagined turned out fine for rock collecting and fishing. Overall, we settled in just fine and had beautiful weather the whole week. Say lots of Orcas, all from the shore. No need to take a boat out. Our family of 5 (kids 12, 9 & 6) had a great time at this house. Views are incredible and the private beach kept the kids entertained for hours. The grounds were also great to explore with lots of wildlife. Plenty of space for frisbee and other yard games. The badminton court was an added bonus that was heavily used. The house was clean and the kitchen was well stocked for our purposes. 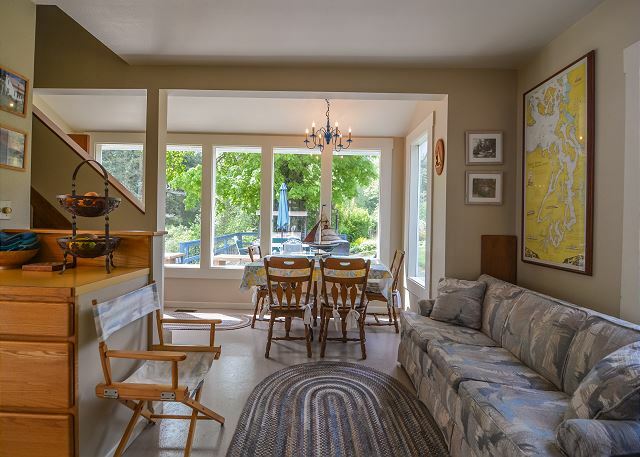 Easy access to Friday Harbor. Would stay again. We absolutely loved this home and the grounds surrounding it! Such a peaceful place to unwind and take in all of the natural beauty. We would definitely come back here again! The location and beach were amamzing for our families. We played, kyaked, crabbed and sunned. We lived being able to bike around the island and then come back for lawn games and out door fun. Beautiful view, private beach, hot tub, plenty of room for me and 8 of my friends. What more could I ask! This was exactly what I was looking for. The house had major character and it was so nice being on such a large piece of property. The private beach was my personal favorite part. 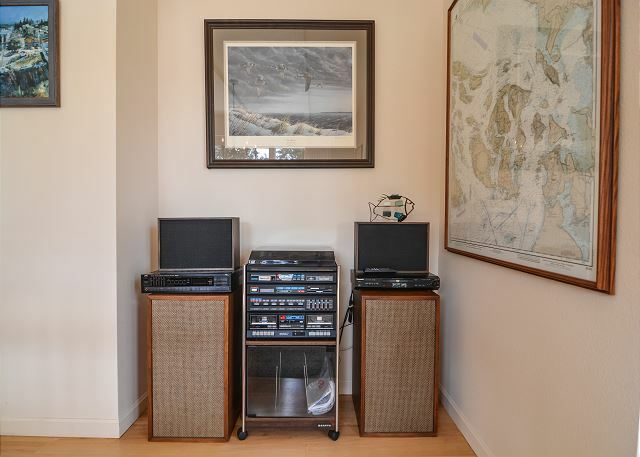 Also, very conveniently located to Friday Harbor. Excellent location, setting and view. Wonderful cove to enjoy. The kids loved exploring the treasures at the cove and searching for snails. I will remember the view from the living room and kitchen for the rest of my life. The management company was so helpful and professional -- as a frequent vacation renter, they were the best I've ever worked with. Wonderful stay! This was a perfect home for our multi- generatial family. The home has bedrooms on both ends of the house with large living areas in the middle. The expansive lawn with beautiful landscaping and beach provide a great play area as well as privacy. It was a very convenient location as well. I hope I have the opportunity to return to this lovely property. The house was better than expected. Beautiful gardens and very functional living space. I stayed here with my husband, two kids (3 years and 9 mo) and my MIL and FIL. We had plenty of room. The private access beach was one of my favorite parts of the trip. Would love to stay here again. Lovely location very close to town. Grounds were amazing & private beach access was the icing on the cake. We loved sitting on the deck with coffee looking out at the view. Great house, perfect location, excellent vacation! Spent a week at the house with family. 6 adults slept very comfortably. My aunt and uncle joined us for 2 nights and used the loft with twin beds. This was fine for a couple of nights, though might be tough for adults for a whole week. Highlights were the expansive grounds with beautifully maintained landscaping and lawns. Perfect for lawn games. Easy walk down to the beach from the house. We rented a boat and used the mooring buoy for several days. The house was clean and comfortable with beautiful views from the living room. Kitchen was well stocked and bigger than the pictures portray. Quick drive to town, easy walk to the golf course. Because of a heat wave the upper bedrooms were quite hot when we arrived. After sweating through one night, we called Windermere and were promptly provided with fans. Wifi worked great inside the house for those of us who had to check in with work. Overall great experience! Outstanding location. Great for kayaking. Nice little beach, but no long beach walks here. Beautiful grounds. One thing to know is doors to master bedroom has no locks if that is an issue. Also there is a 10am check out time instead of the standard 11am...and the cleaning crew was there at 11am. 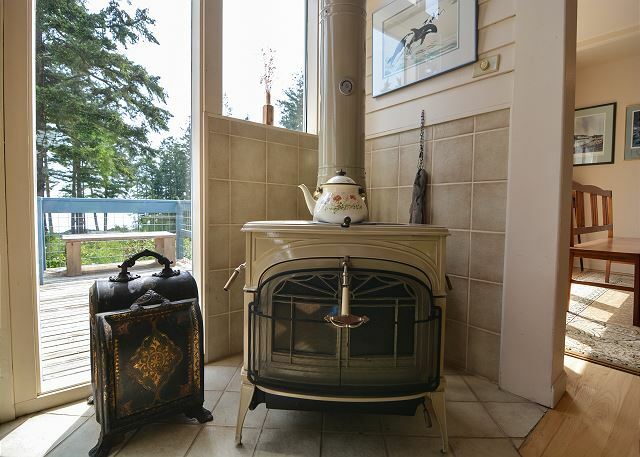 This also may be more of a San Juan islands thing due to the number of rentals. 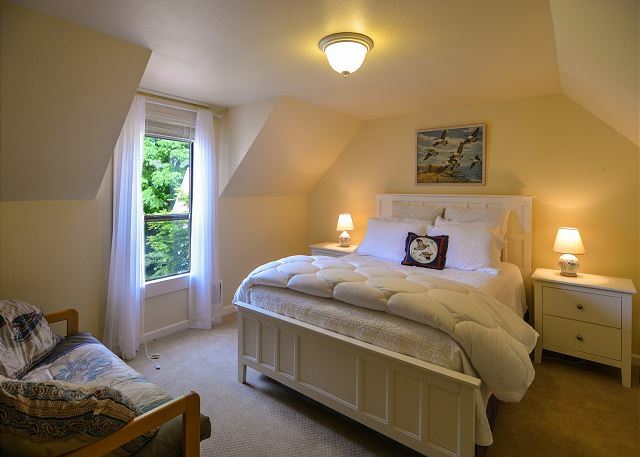 Overall a very enjoyable stay with a great location. Our time here was amazing! 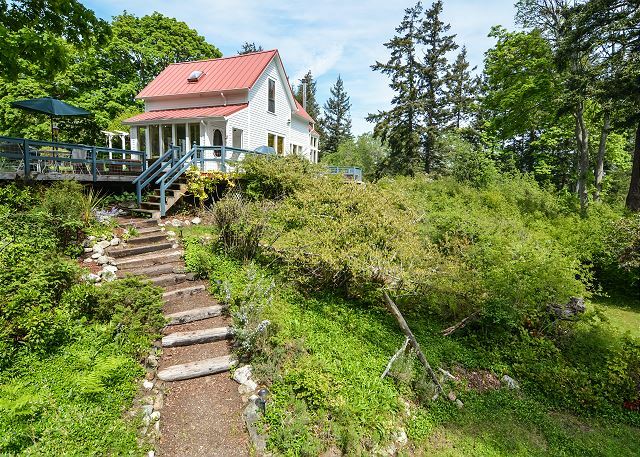 Everything was perfect and I would highly recommend this property. It far exceeded our anticipations. I would come back to this same spot. Our only issue was the cell phone reception was too poor too hold a call and the satellite internet was slow and/or spotty. This made it tough for us to take such a long vacation. Otherwise, we loved the place and have almost no complaints. Our family of 7 enjoyed our 4 night stay. A couple of suggestions may help the next family: availability of a high chair, basic condiments (salt,pepper,sugar). This was a great house for two families with young children. The little beach was perfect. The views of the water were wonderful. Beautiful house and location, lovely gardens, private beach, incredible view of Mt. Baker. We managed to lock ourselves out one night, and were swiftly aided by the management team! We would definitely return to this vacation house!